21. Resident Evil Gaiden (GBC, 2002): Despite starring Leon S. Kennedy, this weird spin-off for the Game Boy Color feels nothing like a Resident Evil game. With its top-down view, it looks like a classic Capcom game for the NES with a Resident Evil overlay, and although that might sound exciting, it's ruined by some of the worst and most inexplicable combat you'll ever find in a game. Instead of letting you dispatch zombies from that overhead angle, the game cuts to a static first-person view, where you have to time a button press with a meter that darts back and forth on the bottom of the screen. It's a total slog. 20. Resident Evil: Survivor (PS, PC, 2000): Survivor tried to ride the coattails of the hottest videogame craze of the late '90s, repurposing familiar enemies from the first two Resident Evil games in a first-person shooter. Although designed for a light gun peripheral, the version released in the States removed that option due to fears over game violence in the wake of Columbine, resulting in a game that was sluggish and hard to play. There was a sequel a year later that spun out of Code Veronica, and Survivor's reception was so negative in the States that the follow-up was never released over here. 19. Resident Evil: Deadly Silence (DS, 2006): As a handheld port of the original game, Deadly Silence is fine. It fails to bring anything interesting to the table, though, despite trying hard to do so. It introduces a few new wrinkles and concepts built around the peculiar capabilities of the DS, but all they do is unnecessarily complicate a classic. 18. Resident Evil: Operation Raccoon City (PS3, 360, PC, 2012): Not a great game by any means, this multiplayer mess is an action-oriented third-person shooter that puts you and partners in control of a squad of Umbrella Corporation mercenaries during the initial Raccoon City outbreak. So you're the bad guys in a barebones action game that feels like a thinly veiled cash-in. With the right team Operation Raccoon City could be fun, but mostly it's worth skipping. 17. Resident Evil Outbreak: File #2 (PS2, 2005): An expansion for the online-focused Outbreak, Outbreak: File #2 suffers only because it feels like more of the same. With the same playable characters possessing the same basic skills as the first game, these five new missions are basically a DLC pack printed on a disc and sold separately due to the limitations of the day. If this came out even a year later for the Xbox 360, it would be a downloadable expansion and not a disc. Like Outbreak, it's surprisingly fun, but not particularly memorable. 16. Resident Evil: Dead Aim (PS2, 2003): A cut above the earlier light gun shooters based on Resident Evil, Dead Aim combines third-person motion with first-person shooting for a weird hybrid experience. It's an odd little aside, but not as fun or fully formed as the later light gun games for the Wii. 15. Resident Evil: The Mercenaries 3D (3DS, 2011): The Mercenaries turns a popular minigame from Resident Evil 4 and 5 into its own handheld experience, one where you have to kill as many zombies as possible within a set time limit. It's another spin-off that borrows the look and feel of Resident Evil for a limited, specific and different type of game, but at least it's a concept that's already familiar to Evil fans. 14. Resident Evil: The Darkside Chronicles (Wii, PS3, 2009): The second on-rails shooter for the Wii catches players up on two of the earlier Resident Evil games, offering both expanded takes on previous scenes as well as new perspectives from other characters. It's a fun and simple shoot-'em-up that loses a lot of the creepiness inherent to these games, but if you miss old-school arcade light gun shooters, or just want to experience as much of that Resident Evil atmosphere as possible, you'll probably enjoy it. 13. Resident Evil 6 (PS3, 360, PC, 2012): Resident Evil 6 was an inflated, boisterous monster of a game. Crammed with fan service for every kind of Resident Evil game from the original to Resident Evil 4, it ran for over 30 hours across four campaigns, which intertwined with each other on occasion. It had an impressive control scheme that gave its combat a surprising amount of depth, and its graphics are still some of the most impressive of the last generation. But all the fan service and control nuance was wasted on levels designed so poorly, combat encounters so frustrating and a story so insipid that finishing it became an absolute slog. It had everything I could have wanted from a Resident Evil, and it still ended up breaking my heart. It’s not the worst game in the series, but it’s definitely its most grandiose failure. 12. Resident Evil Outbreak (PS2, 2004): The first Resident Evil game that could go online, Outbreak brought co-op to survival horror. Placing you and your partners at the start of the zombie scourge, Outbreak offered a novel spin on a formula that was already well-defined by then. Instead of watching your friend struggle through Raccoon City, you could now pick up a controller and help out—as long as you had a broadband connection. 11. Resident Evil: Revelations (3DS, 2012): The biggest crime Resident Evil: Revelations committed was being on a 3DS, a system that was clearly not designed for third-person shooters. Before the New 3DS, you either had to play with the clunky Circle Pad Pro contraption, or deal with aiming with the touch screen or face buttons. It was a much better game once it made the move to higher-end systems in 2013, but it still wasn’t a particularly memorable one; it had some tense moments, but it didn’t offer much when it came to captivating environments, clever shooting, or even a campy story. It offered a relatively traditional Resident Evil experience at a time when fans weren’t getting that, and I suppose that’s all it had to do. 10. Resident Evil: The Umbrella Chronicles (Wii, 2007): This on-rails shooter is like the Cliffs Notes version of the first few games in the series, but it makes great use of the Wii remote. Aiming and shooting with that weird little wand feels like second nature. Like The Darkside Chronicles, it's a distinct take on Resident Evil lore for Wii owners who maybe hadn't played the series before. 9. Resident Evil 0 (GameCube, 2002): Even if Resident Evil 0 didn’t stand in the shadow of the 2002 Resident Evil remake, it would still be a disappointment. Capcom seemed to have thought twelve inventory slots was far too many, and it did everything it could to stymie that advantage: There was no item box, many weapons and key items took up two slots, and there’s a ridiculous amount of items you have to keep track of littered across save points. And while having another character with you added more firepower, it also meant micro-managing two characters who could get mauled by an offscreen enemy. Having a partner with you should have made tackling zombies and obtusely-designed architecture easier; instead, Resident Evil 0 made me wish I didn’t have someone else (and an enormous hookshot) to weigh me down. 8. Resident Evil—Code: Veronica (Dreamcast, 2000): If you played Code: Veronica on the Dreamcast, you probably remember more than anything else that it's long and hard. A notable step forward for the series, and the first to not debut on the Playstation, Code: Veronica isn't the side-step you might think it is, but a crucial part of the Resident Evil epic, and its first steps into the 21st century. 7. Resident Evil (1996) (PS, 1996): The original Resident Evil is plagued by dated visuals, awful dialogue, terrible cutscenes, controls that felt like trudging through mud, and simplistic combat. And yet it’s likely the most famous entry in the series, owing most of its reputation to how much of a landmark it was for videogames. It excelled at creating situations you didn’t want to be in but were compelled to see through. It offered the satisfaction of figuring out the intricacies of a mansion filled with nooks and crannies. It offered a tantalizing vision of what gaming might be like in a few years. It wasn’t the most impactful trendsetter, but it more than made a name for itself. How many other games have managed to flip most of its flaws into endearing qualities? Its terrible dialogue is iconic, fans still insist its controls were essential in creating tension, and its blocky characters immediately bring anyone who played the game in its day back to wherever they were when they first played it. It’s probably impenetrable to most new players now, but its legacy will likely continue to influence games for years to come. 6. Resident Evil: Revelations 2 (PS3, PS4, 360, XB1, PC, Vita, 2015): Resident Evil: Revelations 2 has no business being as good as it is. Even as the sequel to a meat-and-potatoes spinoff, it managed to right many of the things the series had struggled to nail for so long: its staggered two-team progression made managing multiple inventories as tense as it was satisfying; its characters finally delivered dialogue that made you care about whether they lived or died; and it made co-op an essential part of the action rather than a diversion or a way to stall progress. It’s not revolutionary and won’t stress your hardware, but it succeeds at everything it sets out to do. In 2015, a year when the most prominent news about the series had to do with remakes, creating an original game this good was a delightful surprise. 5. Resident Evil 3: Nemesis (PS, 1999): Nemesis beefed up the action of the first two games without sacrificing their utter dread. With more enemies to survive, including the frightening and indefatigable Nemesis, the third Resident Evil gives the player more to do but doesn't lose the distinctive feel or atmosphere of those early games. It was a common sense progression for a series that was an instant classic, and still one of the most beloved games in the Resident Evil catalogue. 4. Resident Evil 2 (PS, 1998): The original Resident Evil defined the survival horror genre, but Resident Evil 2 was the series’ real coming out party. Seeing a framework that seemed built around the idea of small, confined spaces successfully expand its scope to an entire city changed the idea of what horror games could be. Although it was a bit bloated in some spots, Resident Evil 2 made the series’ ill-told and often confusing story seem like it mattered. And in 1998, seeing a zombie outbreak on the scale of Dawn of the Dead play out in a game felt new in its own right. It’s still a little hard to go back to (hopefully the upcoming remake will fix that), but this was one of the best videogame sequels of its time. 3. Resident Evil 5 (PS3, 360, PC, 2009): Resident Evil 5 is hardly a horror game. The early moments where you feel overwhelmed by the infected masses don’t last as long as they should. But the game still ends up being one of the best, most intrinsically rewarding third-person shooters of the last generation. Every gun has an appropriate weight behind it, and as a result, shooting monsters and infected non-zombies feels good even dozens of hours later. Which works out splendidly, since Resident Evil 5 is one of the most replayable games I’ve ever encountered. It makes jumping across each of its chapters to collect gems and better weapons so you can tackle harder difficulties one fluid cycle, and the shooting holds up long enough for the entire journey worth it. So no, Resident Evil 5 isn’t a great horror game. But it’s still among the best games in the series. 2. Resident Evil (2002) (GameCube, 2002): With the recent HD remaster bringing the game’s control scheme into the present, 2002’s Resident Evil remake cements its place as the best version of the “classic” Resident Evil.. Without the tank controls to impede you, the simplistic combat seems like less of a hassle, since it’s easier to dodge out of the way of zombie attacks. And with smoother encounters, everything else falls into place. The back-and-forth trek across the series’ signature mansion gains a powerful momentum when you’re not groaning every time you seen an enemy. Puzzles gnaw at you even when you’re not playing, and seeing every last room on the map light up green (indicating you’ve done all there is to do) feels better than ever. Every piece of this game begs you to barrel forward through it at top speed, and it can enrapture you in a way few other games can. Sequels managed to build on this remake’s formula, but none of them ever reached its highs. 1. Resident Evil 4 (GameCube, 2005; pretty much every other platform known to man afterward): Resident Evil 4 might be the most well-paced videogame of all time. It starts by instilling the feeling that something’s not quite right, then slowly builds momentum as you make your way through a cultish village, a garish castle, and a grotesque rendition of 1980s action movies. 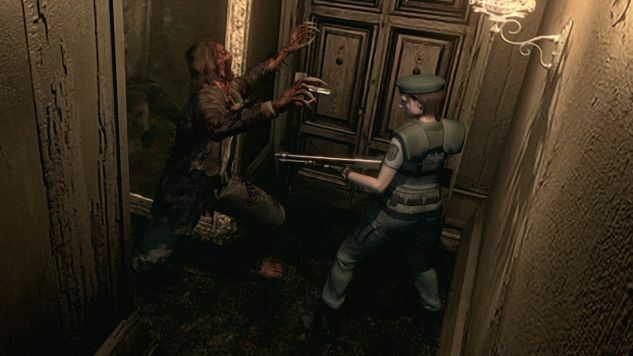 It has plenty of downtime, but never dull moments; from the vulnerable and isolated fight against Del Lago on a motorized skiff boat, to the frenzied defense of a log cabin, to the Alien-esque encounter against the Verdugo, Resident Evil 4 packs more captivating encounters in its 10-15 hours than many entire series can muster. It manages to effortlessly move from creepy to excitingy, making sure the next segment will be as great as the last. Changing the core of the series to make the shooting the centerpiece was a bold move, and it paid off better than anyone could have imagined. Resident Evil 4 is easily the best game in the series, and you can still see its influence in games coming out now, more than ten years later. Throughout its 20-year history, Resident Evil has retained an endearing quality. Like the campy B-movies it cribs from, even when it’s bad it’s kind of good. It’s not the most consistent series, but it frequently shows enough flashes of brilliance that you can’t help but follow along with it, trying to figure out just how this whole virus thing started and why Albert Wesker is such a jerk. I may not always like the games themselves, but I will always root for the series as a whole. And that’s because whether it’s as a thrill ride or a trainwreck, you usually get something out of playing a Resident Evil game. Between all the zombies, viruses, Nemeses, evil corporations and right hands that come off, there’s a lot of Resident Evil to wade through, but we managed to rank every game in the franchise from worst to best.